Scientists peering back to the oldest light in the universe have new evidence to support the concept of inflation. The concept poses the universe expanded many trillion times its size in less than a trillionth of a second at the outset of the big bang. 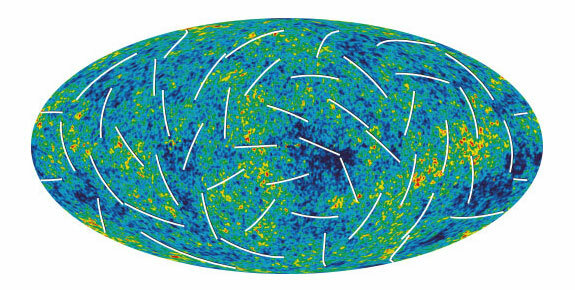 This finding, made with NASA's Wilkinson Microwave Anisotropy Probe (WMAP), is based on three years of continuous observations of the cosmic microwave background (CMB), the afterglow light produced when the universe was less than a million years old. WMAP polarization data allow scientists to discriminate between competing models of inflation for the first time. This is a milestone in cosmology. "We can now distinguish between different versions of what happened within the first trillionth of a second of the universe," said WMAP Principal Investigator Charles Bennett of the Johns Hopkins University in Baltimore. "The longer WMAP observes, the more it reveals about how our universe grew from microscopic quantum fluctuations to the vast expanses of stars and galaxies we see today." Big bang physics describes how matter and energy developed over the last 13.7 billion years. WMAP's observation of the blanket of cool microwave radiation that permeates the universe shows patterns that mark the seeds of what grew into stars and galaxies. The patterns are tiny temperature differences within this extraordinarily uniform light. WMAP discerns temperature fluctuations at levels finer than a millionth of a degree. WMAP can resolve features in the cosmic microwave background based on polarization, or the way light is changed by the environment through which it passes. For example, sunlight reflecting off of a shiny object is polarized. Comparing the brightness of broad features to compact features in the microwave background, or afterglow light, helps tell the story of the infant universe. One long-held prediction was the brightness would be the same for features of all sizes. In contrast, the simplest versions of inflation predict the relative brightness decreases as the features get small, a trend seen in the new data. "This is brand new territory," said WMAP team member Lyman Page of Princeton University in Princeton, N.J. "The polarization data will become stronger as WMAP continues to observe the microwave background. WMAP's new results heighten the urgency of seeking out inflation's gravitational wave sign. If gravitational waves are seen in future measurements, that would be solid evidence for inflation." With a richer temperature map and the new polarization map, WMAP data favor the simplest versions of inflation. Generically, inflation posits that, at the outset of the big bang, quantum fluctuations - short-lived bursts of energy at the subatomic level - were converted by the rapid inflationary expansion into fluctuations of matter that ultimately enabled stars and galaxies to form. The simplest versions of inflation predict that the largest-sized fluctuations will also be the strongest. The new results from WMAP favor this signature. Inflation theory predicts that these same fluctuations also produced primordial gravitational waves whose distortion of space-time leaves a signature in the CMB polarization. This will be an important goal of future CMB measurements which, if found, would provide a stunning confirmation of inflation. "Inflation was an amazing concept when it was first proposed 25 years ago, and now we can support it with real data," said WMAP team member Gary Hinshaw of NASA's Goddard Space Flight Center in Greenbelt, Md.